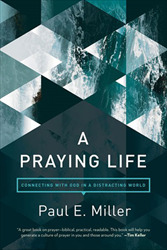 By Paul Miller-- Miller offers a practical real-life approach to prayer for busy families ! His honest down-to-earth advice shows you how to practice praying in the midst of daily routine. You'll learn to pray like a child, live your Father's story, understand unanswered petitions, and more. Includes tips on using tools such as prayer cards and journaling.